For me as a gamer, a strong story is paramount. As a lifelong writer, I truly believe that games are the next step forward as a medium for storytelling. First, you had books, then you had movies, and now video games are the best way to experience and interact with stories. When I first heard about Far From Noise, I was very excited. This is an interactive story where you play as a character whose car is teetering on the edge of a cliff. With time to reflect and death staring you in the face, a moment like this could make for an incredible story. Does it manage to come through with a great story, or does this tale slip off the cliff? 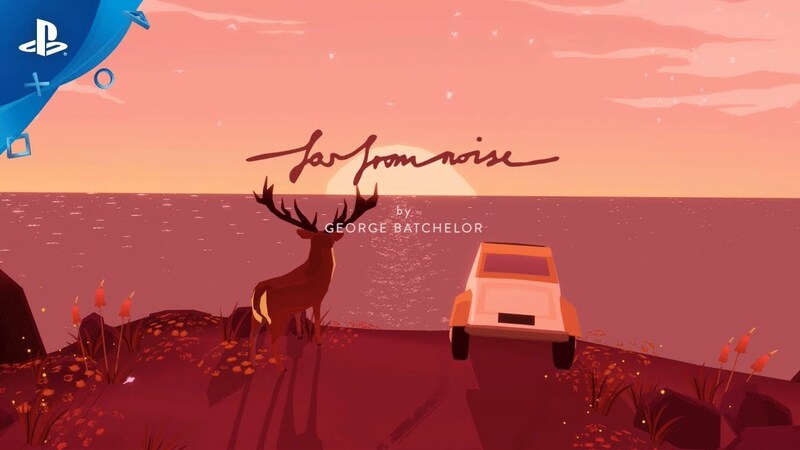 Far From Noise takes place just after a car accident sends our character over a cliffside in their car. The car sits on the edge of a cliff, overlooking the ocean, as you teeter back and forth. Before we get into the meat of the story, it's worth mentioning that this beautiful game was made by a single developer named George Batchelor. We've seen more and more indie games coming out from one-man and one-woman developers, and I think it's incredible. To think that one person, with enough talent and dedication, can bring a game like this one to life, is just amazing. It's one of my favorite things happening in the industry today. I tip my hat to all the incredibly talented developers out there like Mr. Batchelor who are bringing us these incredible experiences and changing the industry for the better. After all, you won't see a single loot box or microtransaction in Far From Noise. With every shift forward, it looks like you're going to fall. Just before you slip, though, the car rocks backward again. As you play the game, the car is always experiencing this balancing act which creates a lot of tension from the moment you begin. The story is conveyed through speech bubbles that appear over the car. You'll have the option to choose from different responses consistently to change the tone of your answer or respond to questions given to you. Since the story is such a huge part of the experience, I don't want to go into details, but I really enjoyed how the game uses a sort of magical realism to keep things interesting throughout. One thing that's shown pretty commonly through the game's trailers, is a talking deer, which is the perfect example. Shortly into the game, this animal walks up beside your car and strikes up a conversation with you. In casual conversation, it sounds insane, but Far From Noise shows us that, during this near-death experience, hallucinations and "experiences" are possible and probable as our character struggles to make sense of everything happening around them. This results in some really unique and fantastical encounters that make Far From Noise more than just a story in a car. The deer represents a kind of spirit animal that offers some pretty profound and very well-written dialogue. It's a nice contrast with the main character, who can be very energetic and sarcastic depending on your choices. Combining this dialogue with the calm and smooth tone of the deer is a great mixture of storytelling dynamics. Ultimately, Far From Noise has multiple endings, but the story itself feels largely the same regardless of how you respond to the questions. The tone will shift, but the overall string of major events is the same. Despite this, I did play the game a few times to see how it could all end up. On the whole, it's a great story that touches upon some pretty profound themes, while also adding a splash of sarcasm and humor. The gameplay in Far From Noise involves choosing responses and watching how it all plays out. There are some options for how quickly the text moves, but otherwise, your role as a gamer will be to make decisions and experience the story as it unfolds. This is to be expected from this type of game. It's a very relaxing and serene experience that doesn't ask you to hit buttons at specific times or react quickly to events. If you're the kind of person who enjoys visual novels or interactive stories, Far From Noise will keep you engaged, but it won't tax you as the story unfolds. I would have enjoyed some more branching options, or perhaps alternate events, but the general arc of the story and the responses will keep asking for your input consistently as the game goes on. There's no time or pressure to choose either, which keeps the atmosphere serene and reflective. Far From Noise takes place exclusively on the cliff's edge where the car rocks back and forth. With some plant life and the occasional animal, it's a simple setting with a great view, if you weren't on the verge of death. The game uses sound to great effect, evening going so far as to sync up the rumble of thunder with the vibrations on the controller if you have them enabled in the options. The music is somber, but it adds to the tone and atmosphere in a great way with a strong use of string instruments. All-in-all, I look back on my time with Far From Noise very fondly. The unique premise comes through with an introspective and engaging story. It could have been more flexible perhaps with the outcomes and events, but I would highly recommend this tale to anyone who enjoys seeing how games can be an amazing medium for telling new stories.